The Port’s dry storage facility has over 230 spaces, with call-ahead launch service, a daily round trip launch, wash-down area, variable seasonal rates and hours, and tenant rewards. Call us at 425-673-2015 or 206-940-1348 to schedule a time to signup. Space available for power boats ranging in size from 18 – 32ft LOA. Some trailer space is available for tenants. Please contact us at 425-673-2015 or 206-940-1348 for details on signing up. Tenants may call 206-940-1348 and request same day move to the wash-down area, or same or next day move to the water. Phone requests will be honored within one hour of the call, and must be made 1 hour before last move* deadline daily. Boats placed in the water pre-launch area for “next day use” must leave the dock by 7:00am. Dry Storage tenants may wash their boats, flush the engines and minor detailing and repairs may be made in the wash down area. Best Management Practices do apply, including no spillage of contaminants onto the ground, no pressure washing, and boats must be cleaned under the “no-suds” policy. 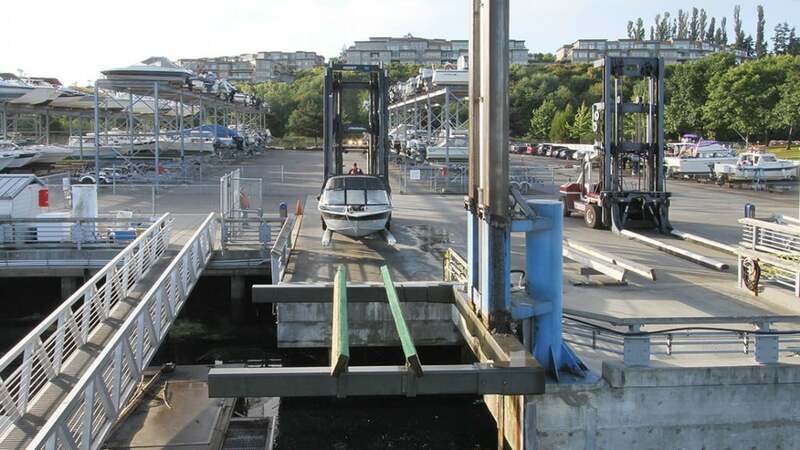 Your boat may stay in the water two nights between Monday and Sunday each week (the first night is free, the second night guest moorage fees apply). Port listed as an additional insured by endorsement. For additional information please see the Port Rules & Regulations Section 4.3 Liability Insurance. During Summer months, the tide will drop to extreme levels, which impact the usage of the launch. Typically service is only affected 1.5 hours before and after a low tide. Please call to confirm the status of the dry storage launch and if service has been impacted by low tides at 206-940-1348. A-dock will be reserved for “pre-launch”. If you are planning on going out before dry storage opens, you can call the day before and ask that we put your boat in the water for “next day use”. 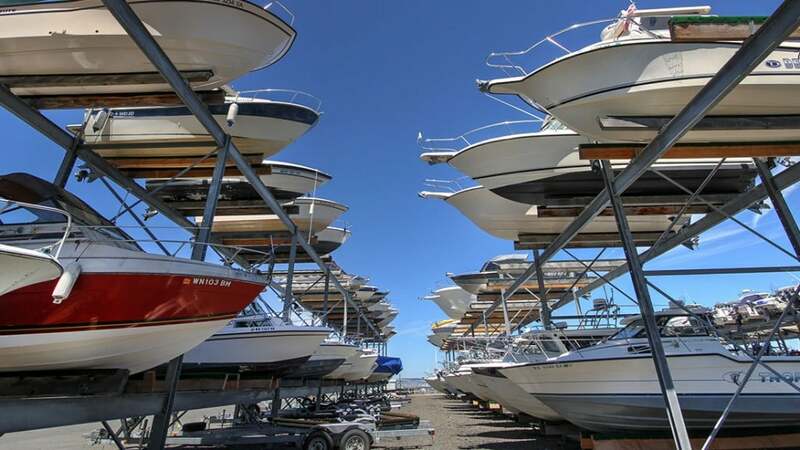 Your boat must leave the dock before dry storage opens. B-dock will be the return area. No overnight moorage for any boats returning during business hours on this dock. Boats returning to B-dock during business hours will be removed from the water. Overnight moorage guidelines. In water 1 night per week (Monday-Sunday) is complimentary. Guest moorage charges of $1.45/ft/day apply to nights in the water exceeding 1 night per week. Returning during open business hours? Go to B-dock to be removed from the water. This dock will no longer have an overnight area for boats returning during business hours. Go to A or B dock and your boat will be removed from the water when dry storage opens. Wash Down Area. During peak times, Port staff will enforce time limits of 45 minutes in the wash down areas to satisfactorily accommodate all users. All moves between move-in and move-out will be charged at a rate of $25.00 plus tax. (For example: Move from rack to wash down $25.00 plus tax, move from wash down to rack $25.00 plus tax). Inquire at our marina operations office if you are interested in securing one of these 10 spots.